I would like to reflect on some of the challenges I faced while writing my recently published book, William and Elizabeth Paterson – the Edge of Empire. The book is a dual biography of a couple largely forgotten in Australian history. 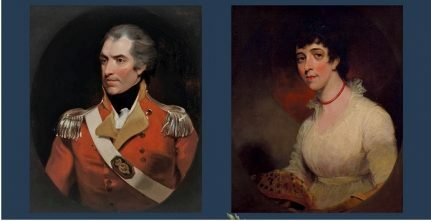 Its scope includes William’s natural history excursions in southern Africa in the 1770s, his service in the British army, fighting the French and local rulers in India in the 1780s before marrying Elizabeth and arriving in Australia in 1791 as a captain in the newly formed NSW Corps. From this point the book spans the history of the colony for nearly two decades, ending in 1810 when the NSW Corps, by then rebadged as the 102nd Regiment with Paterson as its colonel, was recalled after Governor Macquarie took office. The Commissariat Store in Sydney. It was commenced under Paterson in 1809 and completed by Macquarie in 1812. It stood for well over a century as a mark of Paterson’s rebel government before being demolished in the 1930s to make way for the Maritime Services Board building, now the Museum of Contemporary Art, at Circular Quay (State Archives and Records NSW). The book features a Paterson-centric account of well-known events, including the rum trade, the 1804 Castle Hill rebellion, the deposition of Governor Bligh in 1808 by one of Paterson’s officers, and Paterson’s performance as governor during two interregnums. Equally important, the book attempts to get to know William and Elizabeth as real people, to come face to face with their personalities, strengths and shortcomings. In all of this, Paterson’s patron and colleague, Sir Joseph Banks, along with the Royal Society and the pursuit of natural history, loom large in the narrative. William botanised whenever official duties and his health would allow, and in the process became Australia’s first Fellow of the Royal Society. While the Paterson history felt like an unploughed field, the events encasing the couple were much tilled. This represented one of my challenges ­– how to best handle the plethora of writing, both scholarly and popular, on the so-called ‘rum corps’ and ‘rum rebellion’ without them weighing me down like Coleridge’s albatross hanging round the neck of the Ancient Mariner. I was determined not to be swayed by populist, but arguably flawed, views of key events, especially those involving Bligh. My approach was to rely heavily on primary sources and make up my own mind while acknowledging previous scholarship and noting divergent views. This allowed me to reappraise the demonised ‘rum corps’, re-evaluate officer trading and the performance of the army governors during the two interregnums. An associated challenge was the degree to which I should include the underlying historiography – the wealth of scholarly material on, for example, the Enlightenment, natural history and Empire – all relevant to the Paterson narrative. I agonised over this for some time before deciding I was not writing a PhD thesis nor a journal article. To balance scholarship with wider readability, I only occasionally used the scholarly vocabulary of imperialism or wrote of concepts such as ‘colonial eyes’. I chose instead to make extensive use of endnotes to provide points of engagement for those seeking more than the narrative. Hopefully, though, my understanding of key concepts informed my writing without cloying it. That’s for others to judge. Another challenge was to allow Elizabeth Paterson to emerge from William’s shadow, to give her a voice and presence in the narrative in her own right. With the weight of archival material favouring William, the search for records about Elizabeth became critical. Precious scraps of evidence had to be gleaned from diverse sources. Fortunately, there is just enough surviving correspondence to provide some idea of her personality and to see her in three dimensions. Elizabeth’s role in the establishment and management of the Sydney Female Orphan School also helped to raise her profile. The more I discovered about the Patersons the more I came to like them, and so a final hurdle was to avoid writing a hagiography. Had I become too close to my subjects and was my credibility at stake as a result? As I wrote I found myself disputing the darker conclusions of previous works, such as the wickedness of the ‘rum corps’, officer trading, government during the interregnum and Paterson’s drinking habits. Conscious of the danger, I was careful not to sanitise the narrative but to include shortcomings, particularly Paterson’s weakness as an administrator and his lack of political savvy. I strove to support my conclusions with credible, primary-source evidence. Again, others will judge if I succeeded. One of the reasons I thoroughly enjoyed writing the book was the discovery of personal accounts of major events in the colony’s early European history. During the 1804 Castle Hill rebellion, Paterson’s job was to oversee Sydney’s defence in case the ‘croppies’ overran the Parramatta garrison. He sent Major George Johnston in pursuit of the rebels. Only in 2002 did the NSW State Library purchase Johnston’s letter book. In it Johnston tells friends how he quashed the rebellion, beginning with ‘I have been five nights without pulling my clothes off …‘ and so on. In another personal account, Elizabeth Paterson, who had a razor-sharp wit and a wicked sense of humour, recorded Bligh’s return to Sydney in January 1810 after Macquarie had taken office. In an unguarded letter to a friend she wrote: ‘…up comes the scruffy Commodore, and lands on the Queens Birth Day, just as we were going to Dinner at Government House … [he] was so angry at the Governor asking the Rebels to his Table, that he knew no bounds to his malice and vexation‘. Discovering these and other frank accounts was one of the rewards for working on the book. The book is available through Paterson Historical Society. I liked your thoughtful mission here, especially your struggles with what to do about an overwhelming existing historiography. It sounds to me like you’ve navigated an excellent course without – as you say – turning an enjoyable book into (another) PhD thesis.